Hey folks. I'm new to the world of VFRs, but not Hondas. I frame-off restored a 77 CB550K 7 years ago, and I daily a 84 CB700 Nighthawk. Personally, I think that $1600 price is ridiculous, given it has sat for 20 years. My CB550 sat for 30 years, so I know how much it can take to bring life back to an otherwise complete specimen. 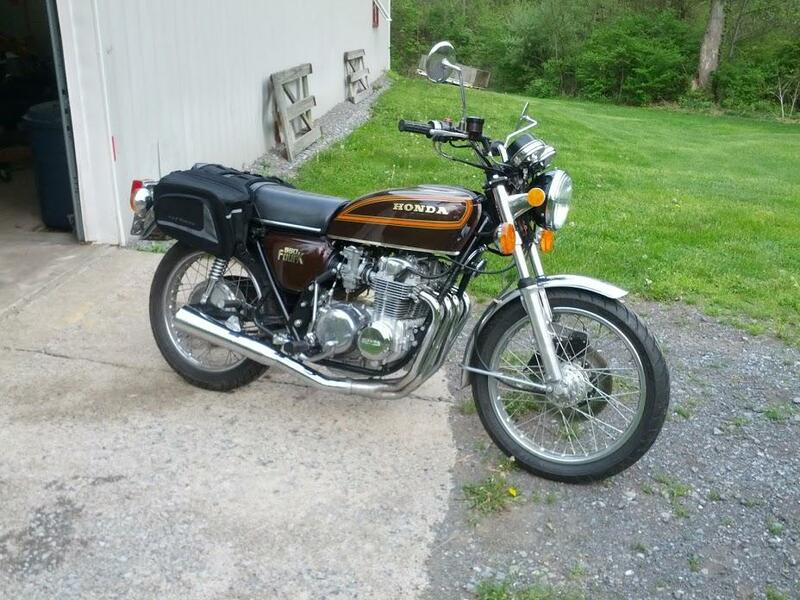 I've sent a question to the seller inquiring about: 1) condition of gas tank insides, 2) mileage, 3) does the engine turn over (my CB550's was seized, but that's what got it parked in the first place back in '81). Thoughts on price? What would this bike fetch with, say, <50k miles in good running condition? Are they really that rare and sought-after that a non-runner could go for more than $1k? By the way, everyone loves pictures! See attached. what's your nighthawk worth ?? 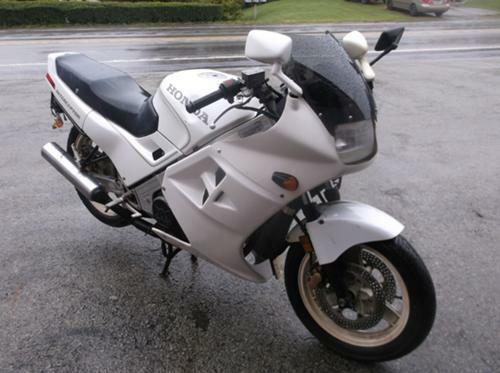 the VFR will need a carb cleaning but it has a rare centerstand and is a bargain at $1600. just be sure the engine turns freely. Agreed on the left side! The front plastics are also missing decals, and the right rear turn signal is dangling in the breeze. Seller is a small town dealer, so I might assume he's reporting the model correct. Will double check. I picked up my nighthawk for $700. Guy was asking $800. Needed a bunch of work and parts: tires, carb cleaning, plugs, new reg/rec plugs and other miscellaneous electrical work, battery, one fork seal, brake caliper rubber parts, clutch and brake master cylinder rebuild, clutch slave cylinder rebuild, clutch hydraulic lines. Think that's it. I later ended up with a failing ignition coil and replacing intake manifold rubbers to chase down the smallest of vacuum leaks that kept me from getting the carbs perfectly sync'd. Last winter I pulled the exhaust, sand blasted some rust/dents/pitting and tig welded it back up and sanded it smooth, and had the whole system ceramic powder coated. 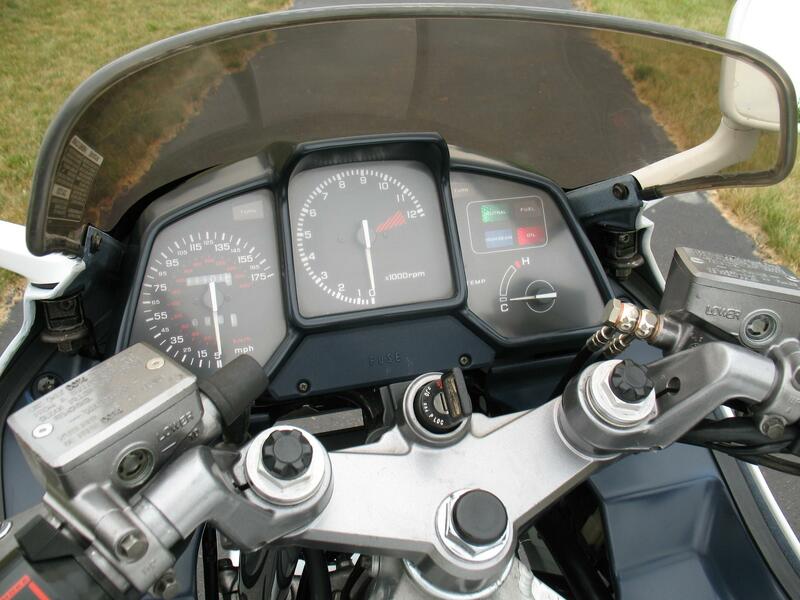 This winter I'm replacing speedo and tach gauges that have both broken. The fun never stops! I probably wouldn't take less than $2k for the nighthawk, but I'm also not selling it any time soon! I missed that VFR center stands are rare, good catch. I am not where the bike is today.The engine turns over and I think the tank is good.I will get back to you asap with the info. So there's hope. He also mentioned having a CB350 Four in his barn, which is my other next-on-my-list bike. Perhaps I can put together a package deal! Did the US bikes come without them as standard or are they commonly removed? This bike has no estimated value. It's worth whatever the seller can get someone to pay. The reason is that there's too many unknowns. You mention 50K miles. That would be a deal-killer for me because there's too many other 2d-gens out there with 20-30K miles. Some other considerations; those original mufflers are hard to find in excellent condition, so their condition is an important factor, the headlight and side fairings don't appear to be original; if they're not Honda parts, that's a major minus. That extra mirror is weird. Look at the side engine covers (clutch and alternator) for accident evidence but that's quite common to find after so many years. There's no seat cowl pictured; hard to find. The chin fairing clips are not in place; hard to find. I assume everything needs going through on projects that I find, so that's a given...brakes, carbs, valve adj., electrical, etc. Gas tank interiors can often be saved, but not always. On a bike like this, I assume there's a 50/50 chance that it will end up being a parts bike and go from there. BTW, if the engine doesn't turn over, run away, it's not worth it. The seat cowl and center stand were dealer options. Just my $.02. Excellent. And thanks for the inspiration. I'm asking for more pictures, of both bikes, all sides, closeups of the headers and collectors/y-pipes and mufflers. Seller is 2 hours away, so I want to get as much info as possible before taking the truck out. What gave the fairing away, other than no decals and different turn signals (at least compared to yours)? I figured the front fairing was either a replacement or aftermarket anyway. Not sure how much it matters to me, as long as it's in one piece. Were these ABS plastic or fiberglass? I can work with either, just curious. The fairing: seems to be missing the center mounting screw hole (in the turn signal area), also the side fairing aero openings "seem" to be more rounded (but hard to tell in the photo), which is indicative of a replacement fairing, either Crites (fiberglass) or Airtech (ABS?). You'll determine originality by seeing if there's duct mounting fittings and sound deadening on the backside. Also, because the chin point isn't fastened, there may not be clip brackets in place, also indicative of aftermarket fairings. Non-original fairings are a major minus. The OEM fairings are ABS. The headlight fairing is suspect because the headlight isn't fitting properly. The windscreen also looks non-original. You'll want to inquire about the fairing infill panels which fit between the fuel tank and side fairings, right & left. These are getting very difficult to source. They will be blue on this '87 700 F2. as will the "square" instruments. Test that the engine is free by selecting a higher gear and rolling the back tire forward. I don't know what you want this bike to be for you, but that will determine what you're priorities are. Remember, a cheap vintage vehicle can be the most expensive route to a nice one. That site just times out for me (presumably because the wrong side of the pond and they have GeoIP fencing). Would you mind posting the pictures? I didn't think the US got the "square" clocks on anything other than the VFR 700 F2 and the 750's were all round clocks (and also RWB while the VFR 700 F2 was available white)? 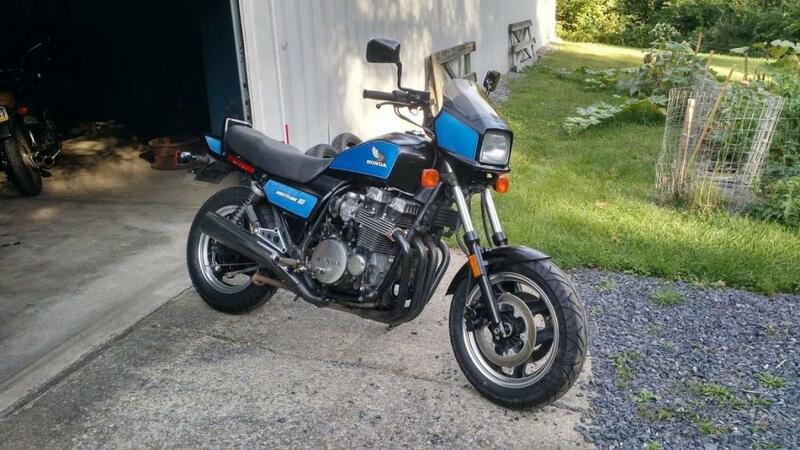 This bike sat in a garage for about 20 years.It is in decent shape,but has not ran since it was parked way back when.This bike restored is very desirable.I've seen them sell for 4-6 Thousand in good condition.These are also great to customize.They are fast and handle great.You can do so much with them after you strip them down.Clean Title. Asking $1600,make me a reasonable offer and its yours. I want to do something with it but no time,so I'd like to see someone put back to use. In addition to what has already been noted, the fairing indicator is non-original (should be on a stalk) as is the screen and it is missing the writing on the top fairing which alongside the poor fitment as BluRoad says indicates a badly fitted aftermarket one. I strongly suspect it is a VFR700 not a VFR750F. Personally unless you get it very cheap (and I don't know US prices for comparison but it seems pricey to me) this looks more like a parts bike to me. It's hard to judge from just the one picture. I'm waiting on more. I've seen a couple different styles for front turn signals. I don't have any plans for it other than to ride it, if I do get it. If it's mostly original, I'll keep it that way. Otherwise, we'll have to see what's good and what isn't, and that'll inform the direction I take. There are two OE styles...86-87 "stalks" and 88-89 "flush". 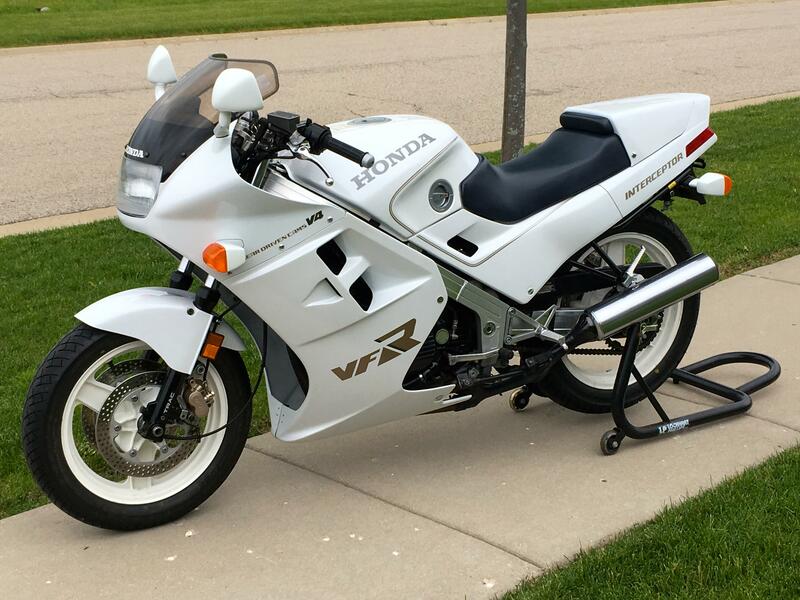 The US didn't get the 88-89 model VFR750F so missed out on the second style but even then, the OE ones are colour coded and look totally different. Like these ones. Those ones look more like these generic "fairing" indicators. They're 100% not original and while there are genuine reasons for a respray after 30 years (mine was originally red but is looking awfully pink these days) alongside all the other signs it really does look like a bad aftermarket fairing replacement. if your nighthawk is worth $2000, a clean, good-running VFR700 would be fairly priced at about $2200-2400. Seller just got back to me. It is indeed an RC26. Can't say I'm terribly interested in it now. It was also pointed out that there's what looks to be a dent in the tank in the one picture I have of it, right under the ND in HONDA. I've got the bug now, so the search continues!